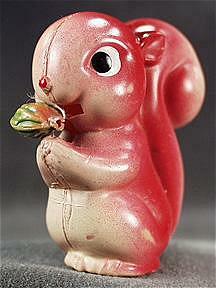 Another new vintage squirrel; this one's for my collection of ceramic animal figurines with fur. 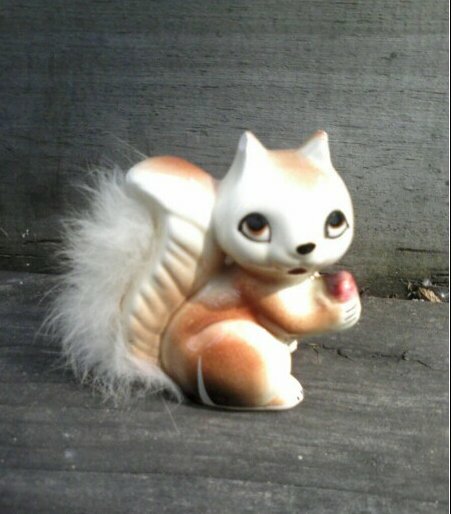 According to Regretsy, the home for horrible Etsy products, the squirrel-fish taxidermy above could be purchased for the low, low price of $350.00. 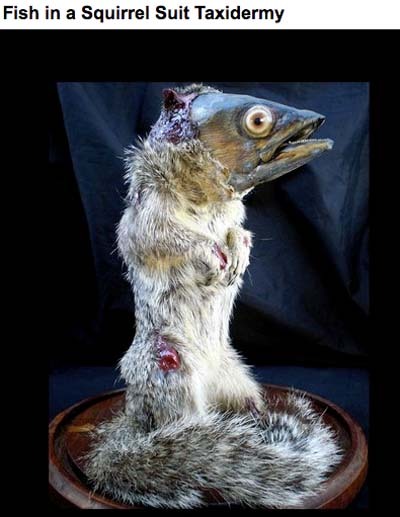 I'll bet, if I comparison-shopped, I could buy a freakin' crate of non-fishy taxidermied squirrels, which I could then superglue fish heads on to. And I realize, well, if I am going through so much work to try and reproduce, en masse, the insane work of art above, I should probably just pay the guy $350. It's always good to have something absurdly happy to occupy yourself with while waiting for the prayer service to start! 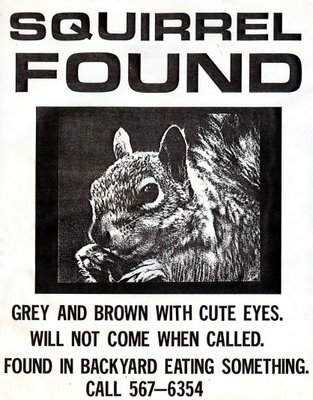 SQUIRREL FOUND! "Johnny C" over at A Hole In The Head had this on his fridge for a while, after meeting the creator, an underground comic artist. The webpage has a version big enough to print out and spread around your own little bubble of the world. Cheetah Velour found this retro-squirrel of kitschy kitchen goodness. I'm tempted to beat her up for it, but then she also found that cool Chuck Norris tee & it probably came with all sorts of skills. 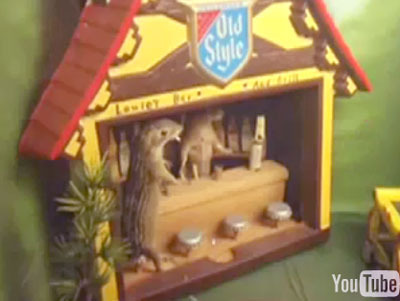 I'm smitten with AT&T's Valentine's Day ad -- not so much for the phones (I don't even think we get that service here, bastards), but as we all know, I'm a sucker for a puppet show. I partially married hubby for his puppet skills, and if that makes him The Puppet Master and myself the puppet, well, I can live with that. 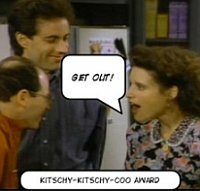 Mouse: You know what I think? Mouse: Heaven must be missing a squirrel. 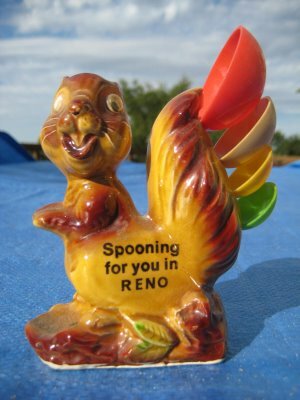 Ms Squirrel laughs, but you know she falls for it. Just as I have. AT&T needs to sell me these finger puppets. Are you listening, AT&T? I don't want an iPhone. Especially as I don't have service for it here. 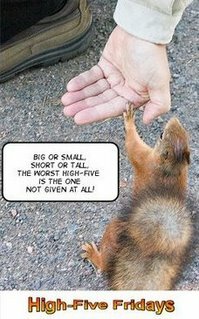 But even if I could, I'd still want those adorable finger puppets more. I guess this whole post makes me AT&T's puppet, posting their ad like that... Unless they make me the puppets. Then I am The Puppet Master.